Lapis Lazuli Corporate Sets: The Perfect Business Gift! Impressive corporate gift for the executive that "has it all". Nothing looks more impressive, luxurious and unique than our corporate sets. Presented in a fine oak box for extra presence. Crafted in pure Lapis Lazuli and Silver Plated metal. An incredible offering at these prices! These letter openers are silver plated, with a solid Lapis Lazuli handle. the long letter opener measures 15 cms (6") long; the sort letter opener measures 10 cms (4") long. They comes in a handsome blue silk box, ready for gift giving. The long letter opener can be monogrammed or engraved. Please add $3.00 for this service. This practical set consists of a letter opener, magnifying glass and ball pen (uses regular ball pen refills). What can possibly look more elegant in any desk? Unbelievable craftsmanship for this price! Your business cards will have all the presence you intended! 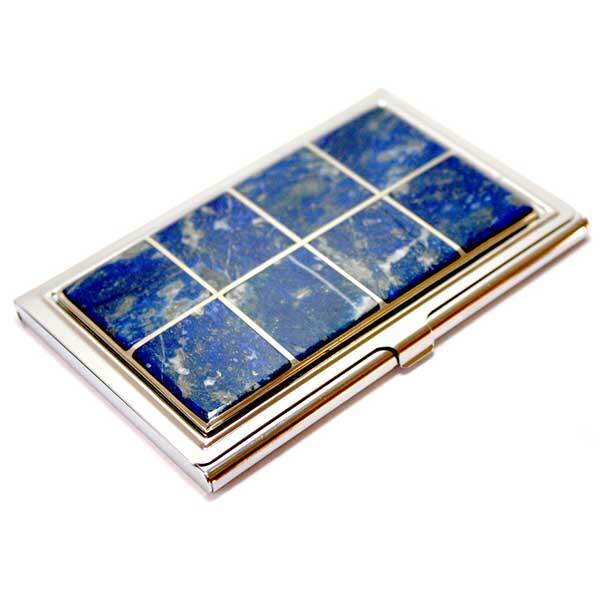 Silver Plated Card holders, thin enough to carry in you pocket or purse (they hold up to 20 standard size business cards), with Lapis Lazuli inlayed. Please add $5.00 for style CCH-7 (see small picture) Add your monogram for only $3.00! This cardholder can also be customized with your company name, gift message, etc. Just select "engraved message" as YES, and place the custom message in the "engraved message" box. Please add $3.00 for this personalization. Incredible! Refillable table lighters crafted in Lapis Lazuli with solid brass lining and top. The small lighter is slightly oval shaped; it is 2.5" tall and it costs $90.00. The tallest lighter is completely cylindrical. It is 3" tall and it costs $120.00. Please note that they shipped unfilled to comply with new parcel requirements. They can be filled with standard lighter liquid (one can supplied, separately). This amazing set is crafted in natural Lapis Lazuli and Silver plated metal and consists of a bottle opener, cork screw and bottle stopper. The perfect wedding gift! Silver Plated bottle opener with a Lapis Lazuli handle, plus a matching Lapis Lazuli bottle stopper. This set comes in a handsome blue silk box.